I know most of the internet loves fall but it’s one of my least favorite seasons. It’s a reminder that winter is coming, that the days are growing shorter, and soon I’ll be trapped inside trying to avoid the cold. There are some nice things about fall: I can convince my husband that I should buy new clothes, I can stock up on seasonal teas and coffees, I can read lots of books curled up under blankets, and it’s the perfect hiking season. To help me survive the transition, I’m always looking for meals that are warm, filling, and full of comfort. This meal does just that. The Beef Bourguignon doesn’t take as much time as Julia Child’s and dare I say, it tastes just as good if not better. A good beef meal for me pairs well with mashed potatoes and these get that nice sweet and savory flavor you can only get from roasting the garlic first. I followed an Alton Brown recipe and you can’t go wrong with that. 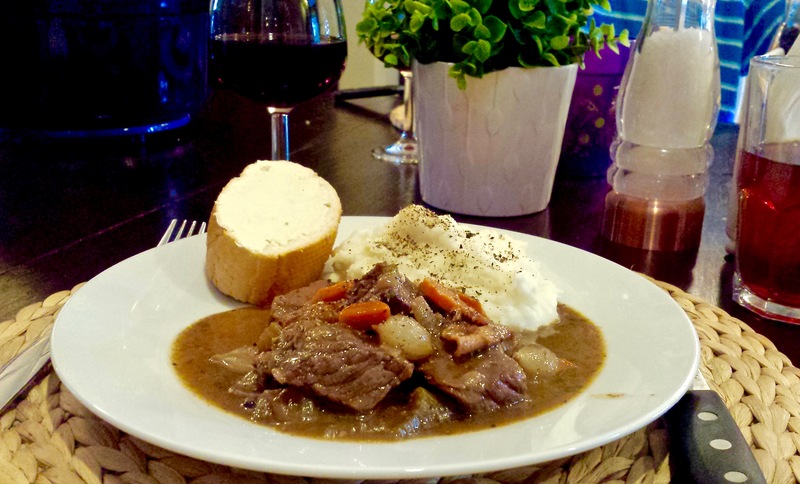 Try his potatoes with Beef Bourguignon or on Thanksgiving and you’ll be a happy camper. The recipe itself calls for a red wine and you should be sure to drink some too. I opted for a Pinot Noir (Line 39, 2013) and it was perfect with the dish and still under $10. Take a large bowl and fill with the red wine, olive oil, onion, carrot, celery, garlic clove, bay leaves, parsley, thyme, and peppercorns. Stir to combine. Cut your beef into 2-inch cubes. Add in the beef to the red wine marinade. Cover beef completely with red wine marinade and marinate from 1 to 24 hours tightly covered in the fridge. Rotate the meat every 6-8 hours. After marinading, remove the beef to a plate and pat thoroughly dry. Strain the marinade into a bowl, separating the liquid and vegetables but reserving both. Heat a large dutch oven to medium high heat. Brown the bacon and remove, leaving the fat behind (about 2 tbsp). Brown the beef in batches in the bacon fat, transfer the browned pieces back to the plate. Cook the vegetables in the bacon fat and fond until softened and browned, about 5 minutes. Add the flour to the vegetable mix and cook another minute until browning. Stir in the reserved marinade. Add the beef and bacon to the dutch oven and pour the pearl onions on top. Bring the dish to a boil. After boiling for a minute, reduce the heat to low and cook covered for about an hour or until beef is fork tender. After an hour, add the mushrooms if using. Cook an additional 20 minutes, covered. Skim any fat on the surface and remove the bay leaf. 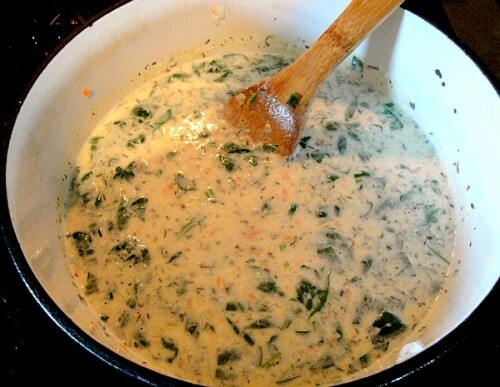 Add chopped parsley and additional salt or pepper to taste. I set my 30before30 goal of making paella because I’d recently been to Spain and enjoyed paella the best of all. I had my paella in Barcelona so it was more seafood heavy than some of the Valencian paellas that are known for their use of rabbit. 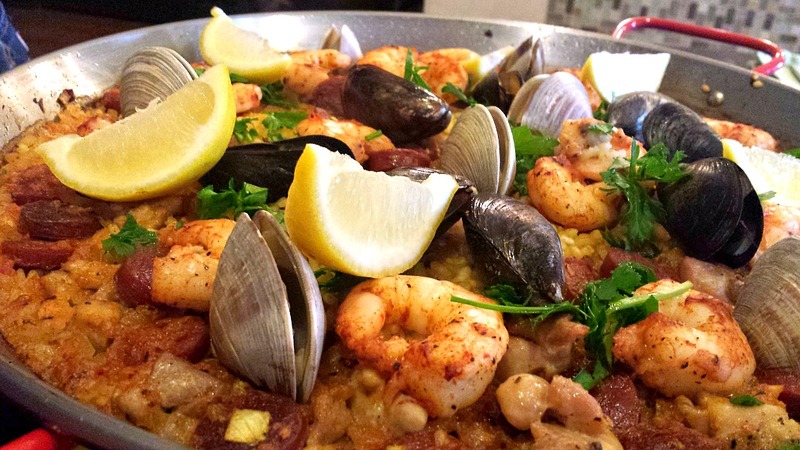 Paella was the very first meal I ate in Spain so to me paella has a special place in my heart. For my paella, I wanted to make a paella mixta. I remembered my paella having seafood and chicken in it with rice and a deep rich taste. The recipe I used was from Chow and it came out perfectly. 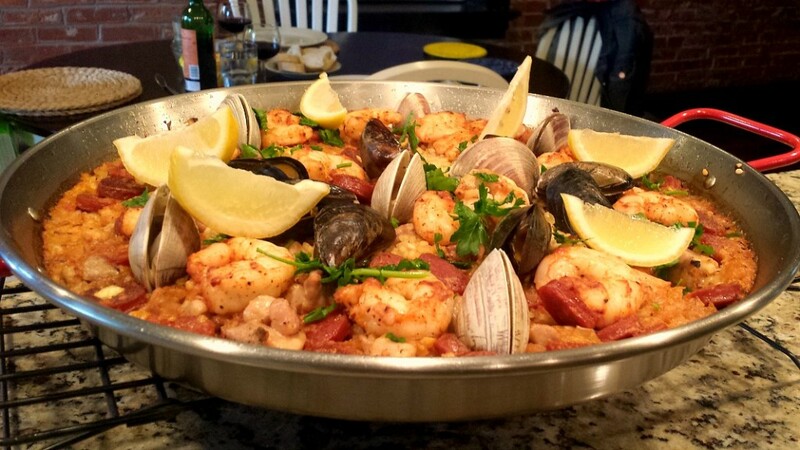 You’ll want to consider buying a paella pan that can be grilled, used on the stovetop, or in the oven so your rice can cook evenly. I was able to find a deal on a paella pan at World Market. I also grabbed some Spanish chorizo while I was there. Make sure it is Spanish and not Mexican for the right flavorings. I bought all my seafood at Whole Foods since I wanted clams and mussels and you can’t always guarantee that will be available at my local grocers. For me, the biggest surprise was how hard it was to find the rice. 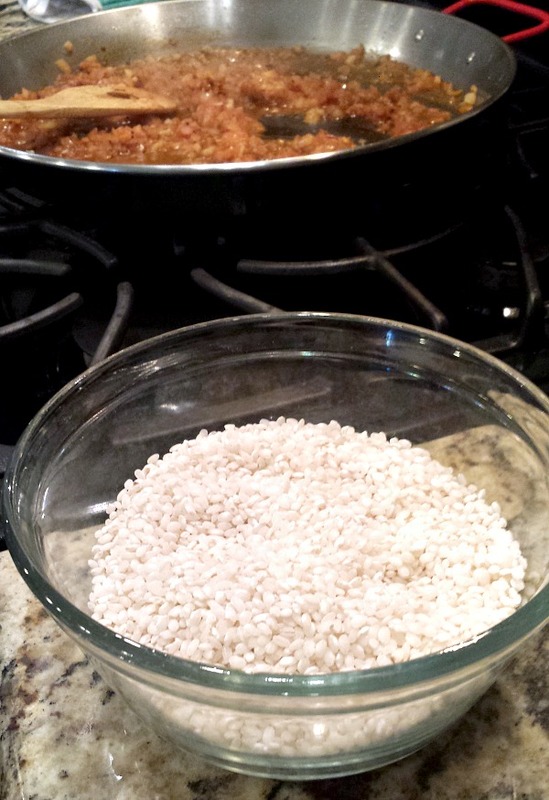 You need a special short-grained rice known bomba rice and despite checking nearly every grocer in St. Louis, I had to go online. It goes by a couple different names but this is the one I bought. The paella itself was fantastic. It makes a complete meal and then some. If you are eating it solo you can eat on it for a few days and if you plan to serve it to a crowd consider making some tapas to start with so there’s enough to go around. I chose a Spanish red wine, a Campo Viejo Rioja Reserva, with ours but with a paella mixtas you can go red, white, or even rosé/rosado. Core and halve the tomatoes. Grate the flesh side of each half on the large holes of a box grater set over a medium bowl, stopping when you get to the skin. Discard the skins. You should have about 3/4 cup of tomato pulp and juice; set aside. Place a 15-inch paella pan across two burners and heat over medium-high heat until hot, about 2 minutes. Add the chorizo to the pan and cook, stirring occasionally, until it has started to brown and the fat has rendered, about 2 to 3 minutes. Using tongs or a slotted spoon, transfer the sausage to a large bowl; set aside. There should be a thin layer of rendered fat in the pan. If there’s not enough, add 1 to 2 tablespoons of olive oil. Add the seasoned chicken to the pan in a single layer and sear, stirring occasionally, until both sides are golden brown, about 6 minutes total. (You will need to rotate the pan occasionally over the burners to evenly distribute the heat.) Using tongs or a slotted spoon, transfer the chicken to the bowl with the chorizo; set aside. Reduce the heat to medium. Add the onion, season with salt and pepper, and cook, stirring occasionally, until softened, about 5 minutes. Add the garlic, remaining 3/4 teaspoon paprika, and saffron, stir to combine, and cook until fragrant, about 30 seconds. Add the reserved tomato pulp and juice and cook until the mixture has slightly darkened in color, scraping up any browned bits from the bottom of the pan, about 3 minutes. Add the rice and measured salt and stir to coat in the tomato mixture. Bring to a lively simmer and continue to simmer, adjusting the heat as necessary and rotating the pan 90 degrees every few minutes, until the rice grains have swelled, most of the liquid has been absorbed, and the rice starts to make a crackling sound, about 12 minutes. Remove the pan from the heat. Arrange the reserved shrimp and the shellfish (hinge-side down) in the rice, nestling them slightly. Place the pan in the oven and bake until the shellfish have opened, the shrimp are just cooked through, and the rice is tender but still al dente, about 10 to 12 minutes. For my sixth wedding anniversary, my husband and I each got the gift of iron. We did some research on how to use our new cast iron pans since neither of us had a history of cooking with them. I’ve found so many new recipes I can’t wait to try or have tried since. One recipe stood out to me: cast iron pizza. The recipe I tried is from Serious Eats. I’ve made it maybe 5 times now and each time I am still amazed at how much like a Pizza Hut personal pan pizza it tastes like. 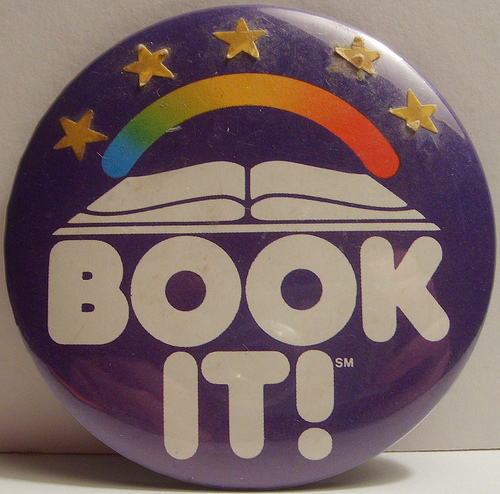 Did anyone else do the Book It program in school where reading earned you pizza? 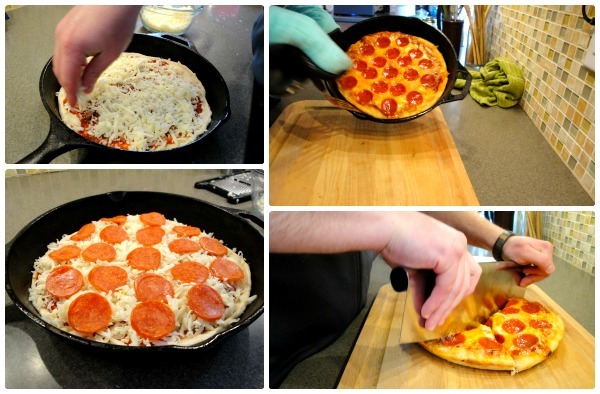 This recipe brings back all my Pizza Hut days. I was always a reader but I’ll be bribed to read more any day for a slice of pizza. I am so impressed at how close this is recipe is to the real thing and I am also so impressed there was once a program that combines my two loves of reading and pizza. This recipe starts by making the dough the day before. You don’t need a kitchenaid mixer, just a bowl, a spoon, and 5 ingredients- flour, kosher salt, yeast, water, and olive oil. I do suggest a scale for measuring but it is up to you. You can top your pizza however you want. 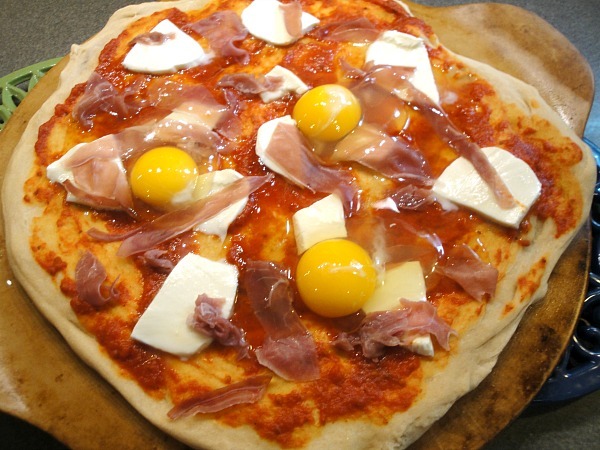 This pizza begs for traditional toppings but you can go creative if you want. The crust is so good so you will want to feature that. 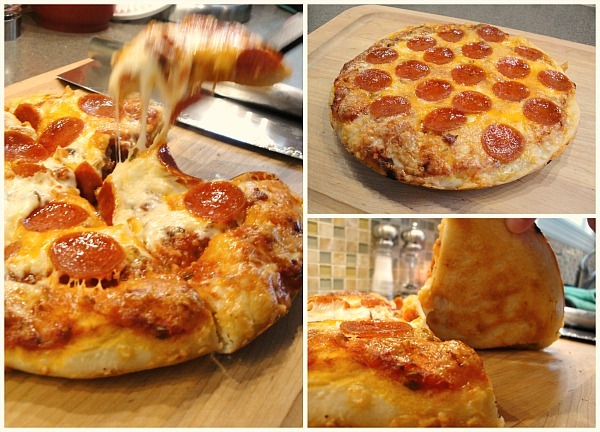 Seriously, look at the crust and the cheesey goodness. 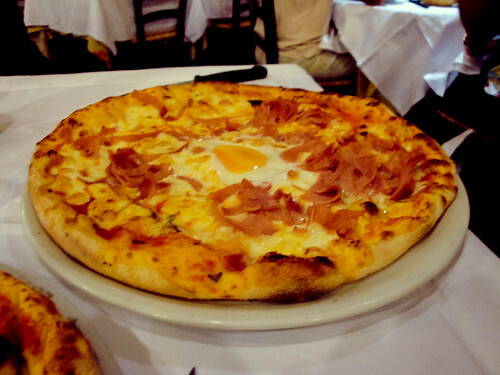 This is the best pizza in the world and you could be making it right now. Don’t forget the best part: This recipe makes two crusts. If you love it as much as I do, you can make yourself another one the next day and relive the experience. Who wouldn’t want that? 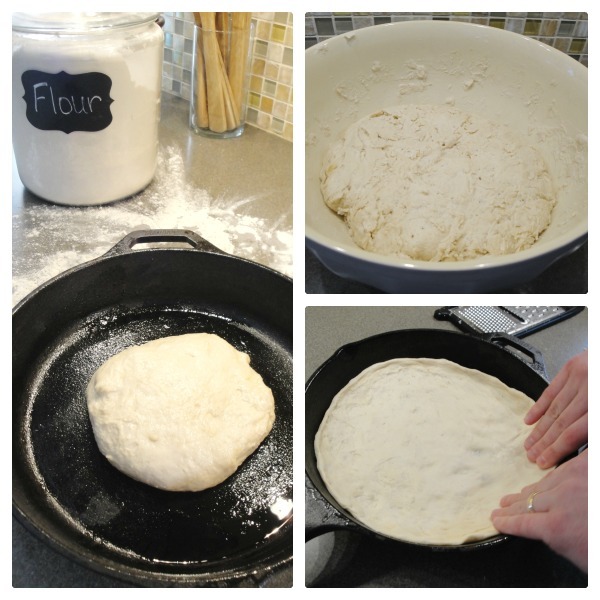 Stir together your five ingredients until all the flour is moistened and combined, adding more water if necessary. Place in a bowl 5 times the size and cover with plastic wrap. Let dough rest 8-24 hours on a counter. Sprinkle dough with flour and separate into two balls. Freeze or chill second ball if making only a single pizza. Pour 1 to 2 tablespoons of olive oil in the bottom of a 10-inch cast iron skillet. Place 1 ball of dough in each pan and turn to coat evenly with oil. With palm of hand, flatten the ball slightly. Cover tightly with plastic wrap and let the dough sit at room temperature for two hours. After 80 minutes, preheat the oven to 550°F. 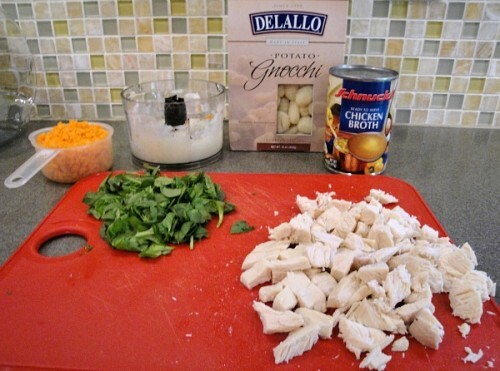 While oven preheats, prepare 3/4 cup of your favorite sauce and shred 4 oz of a dry mozzarella as well as any toppings. Once the oven has preheated (about 2 hours after covering pan in plastic wrap), use your fingertips to press it around until it fills in every corner, popping any large bubbles that appear. Top with sauce, cheese and toppings. Bake in oven for 12-15 minutes. When finished, check bottom for doneness with a spatula. Remove pizza by sliding to a cutting board and allow to cool 5-10 minutes before cutting and serving. I’ve talked just a little bit on here about how last year I went on a trip to Europe. 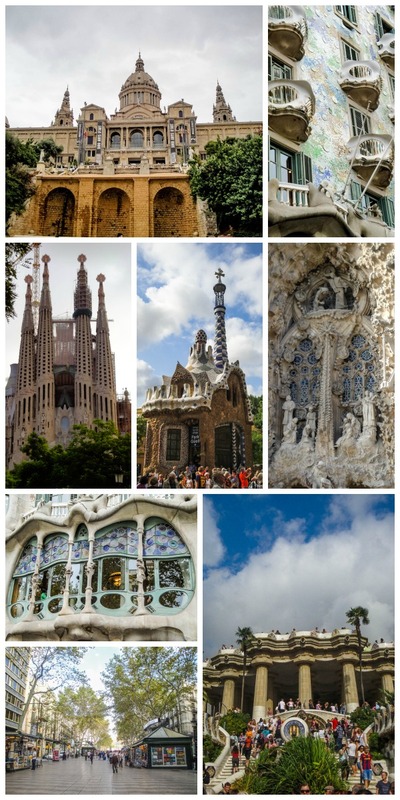 My husband and I started our trip in Barcelona before embarking on a week long cruise. The entire trip was a blast and I still am reminded of it daily. I’ve been trying to incorporate some of the foods I enjoyed on our trip into our meals here at home. Today’s meal is inspired by one I had in Barcelona. It’s not paella (this time) but it was a twist on a classic. My husband and I each had a pizza while we were there. Mine was covered in seafood while my husband’s was topped with an egg and prosciutto. He loved his pizza and I wanted to try to make it when we got home. I started with my usual pizza dough and prebaked it for 15 full minutes. When I pulled it out of the oven, I topped it with about 1/3 cup of pizza sauce and some cheese. Then I sprinkled on a heaping amount of prosciutto. Right before I put it back into the oven, I cracked 3 eggs over the top. I put the pie back into the oven and baked it for another 12 minutes. You’ll want to wait until the egg just barely jiggles upon moving the pan. The egg will keep cooking for a minute or so after you pull it from the oven so don’t keep it in too long. 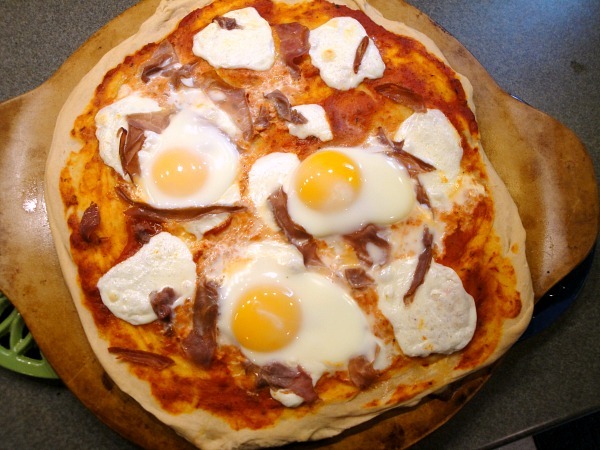 You might be a little afraid of an egg on a pizza but you can think of it as just one delicious breakfast pizza. We ate ours for dinner but no one has to know. Barcelona as a whole was such a wonderful city. I’m just sad to say I only really spent about 2 1/4 days there. I’d go back in a heartbeat. The architecture is beautiful, there are mountains and beaches, forts and concerts, parks and markets. You get the beauty of a coastal city and the excitement of a city that never sleeps (except during a siesta). You can read about my Barcelona experiences on my travel blog. After a top-secret project, I had about a dozen lemons leftover in my kitchen. What to do? Enter Taylor Swift and my love of a local spice shop. Olde Town Spice Shoppe in St. Charles, Missouri always has your basic spices and some blends of its own. They also have local Missouri products. Sadly they do not pay me to pitch for them but I used them for wedding favors and for today’s secret ingredient- lavender. They had edible lavender (meaning not chemically treated) that I just couldn’t leave the store without. Fate set in and shortly after a Vanity Fair article about Taylor Swift mentioned she sipped on lavender lemonade during the interview. At first I rolled my eyes but then I realized I wanted to know what it tasted like and I had all the ingredients. Fate, right? 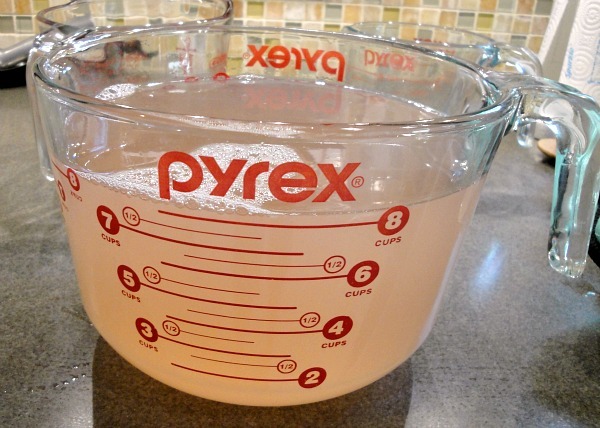 Start by squeezing about 10-12 lemons into a measuring cup. Your goal is to have about 1 1/2 cups (more if you like a tarter lemonade). Set that aside and start working on your simple syrup. 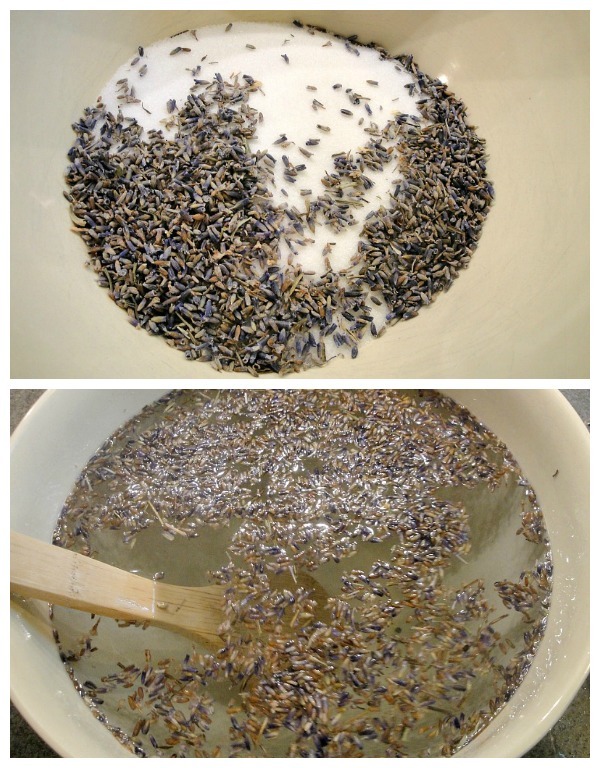 You want to soak your lavender in some hot water with some sugar. Between this and all the lemon squeezing, your kitchen will smell amazing. Next up you’ll want to strain all that lavender off. I used a strainer first and then passed it through a cheesecloth the second time for perfection. Now add that lemon juice from before. My simple syrup was a bit cloudy looking and my lemon juice was yellow but when I blended them together, magic happened. Beautiful. Now add water to taste. I split my lemon mixture evenly between two pitchers and added 2 cups of water to each pitcher for 4 cups total. After chilling I finally had a drink. It tasted like flowers, in a way I think that is probably why Taylor Swift drinks it and why I will have to keep on drinking it. It’s refreshing, sweet, and feels like a spring day upon drinking. Combine sugar and lavender in a large bowl. Pour boiling water over the mixture and steep for 10 minutes, stirring occasionally. Strain the lavender mixture with a strainer. You may want to run the mixture through a cheesecloth if pieces remain. Combine the lavender simple syrup with the lemon juice. The mixture will turn a beautiful rose hue. 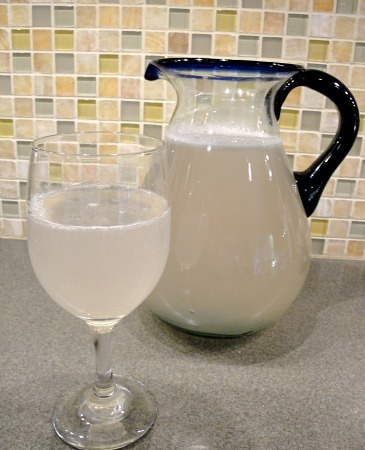 Pour the mix and cold water into a large pitcher and stir. Chill for at least 2 hours before serving. 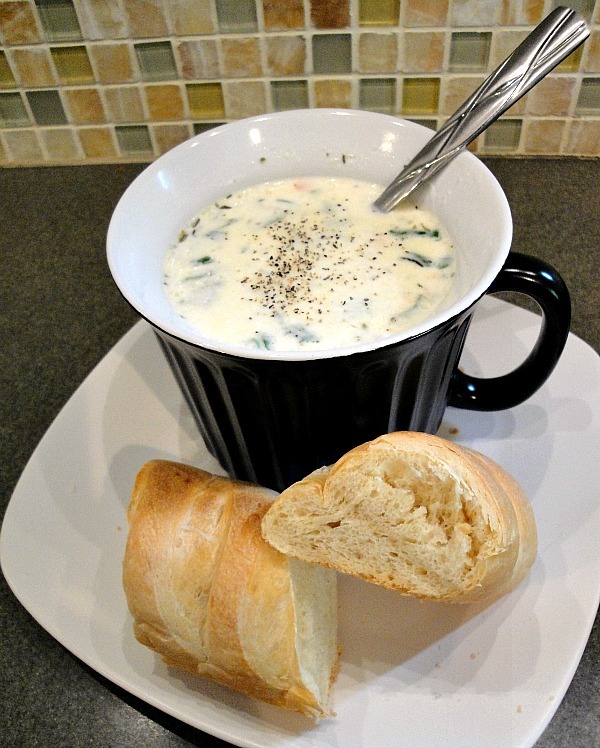 I’m back with one last Lenten meal for you. This one is another healthier-than-fish-fry kind of meal courtesy of Cooking Light. 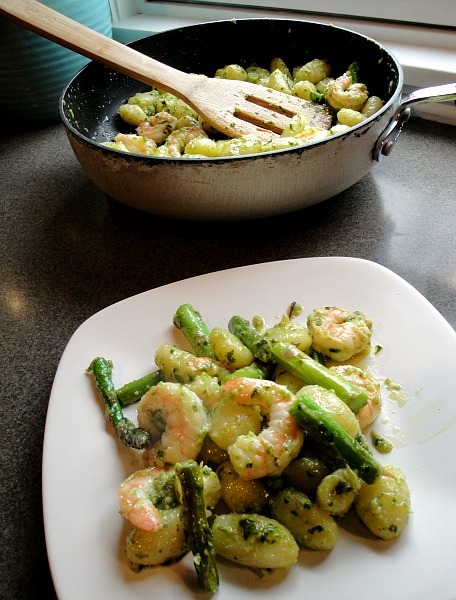 I love that this recipe uses asparagus that’s in season (unless you live somewhere that just had another 14 inches of snow like I did) and has some of that delicious gnocchi I cannot get enough of lately. This meal only takes about 10 minutes to cook and there aren’t many dishes so you can use your Friday night for something other than dinner. Do any of you do a blackout night on Friday? I’ve tried stepping away from the computer and phone for those nights to just devote to some couple time or some reading. It’s easier some nights than others (if the husband is gaming it’s hard for me to stay offline too) but I made it through 3 books last weekend and got back on track for my Goodreads goal. Have a good Easter to you all! I’ll be back next week with some color inspiration. Chop asparagus into 1 inch pieces. Heat up a skillet. Bring 2 quarts water to a boil in large pot. Add gnocchi and boil for 2-3 minutes until the gnocchi rises to the surface. Strain. While the gnocchi is cooking, saute the asparagus in the skillet for 4 minutes. Add the shrimp and saute for another minute. Mix in the gnocchi and the 1/2 cup of pesto and cook for another 3 minutes until done. If you’re like me you’re 2 Fridays away from the end of Lent and are maybe a little sick of all that fried fish. Don’t get me wrong, I love seafood and love fish fry (St. Ferdinand in Florissant has the best in STL if you were wondering) but this is the time of year I’m usually just about done with the same meal over and over again. As a lighter alternative, salmon and cheese ravioli seems a good change. You can throw in a fresh lemon and some fresh spinach to really embrace the spring produce coming into season. This recipe takes only about 20-30 minutes so it’s weeknight friendly so it’s perfect for a Friday or any other night. 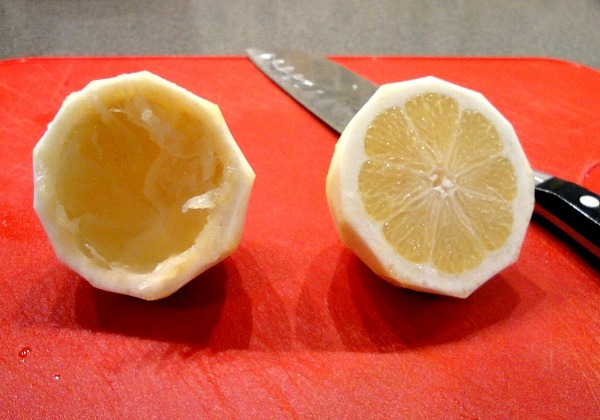 Cut lemon in half. Make a thin slice from each side and reserve. Spray a glass pan with aluminum foil. 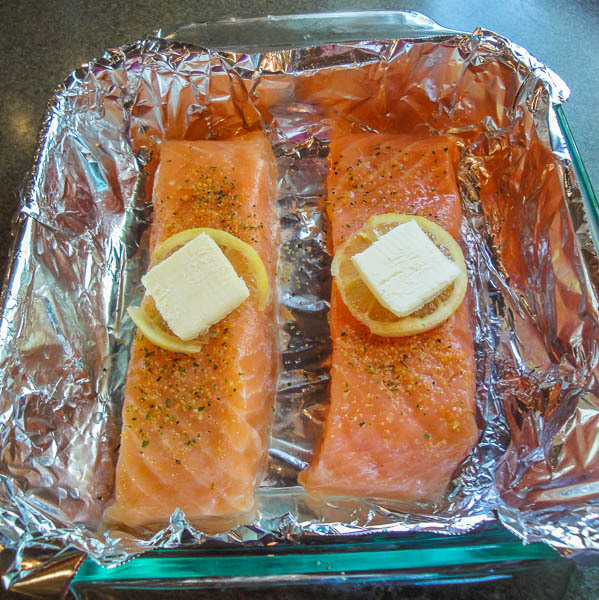 Place salmon in pan and drizzle one half of the lemon over both pieces of salmon. Top each filet with a slice of lemon and 1/2 tablespoon pat of butter. Bake at 350 degrees for 15-20 minutes until flakey. While salmon is baking, boil water and cook the ravioli until it floats to the top. Drain. About 5 minutes before the ravioli and salmon are done, heat olive oil in a pan. Saute the spinach and garlic in the pan and squeeze the remaining lemon half on top. 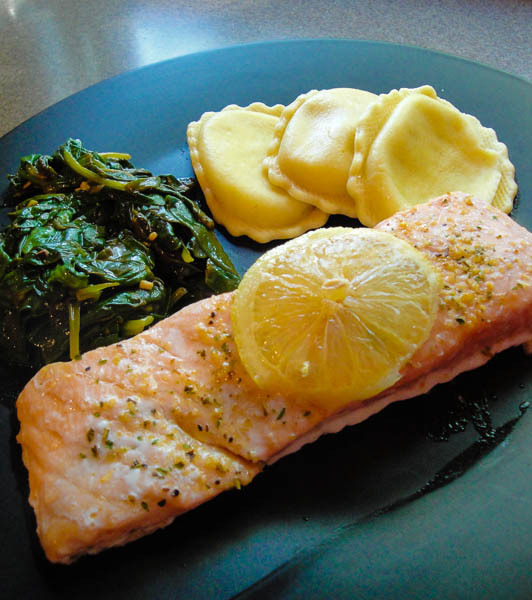 Serve with salmon on top of spinach and the ravioli on the side. The best thing about March has to be Thin Mints. It can’t be the weather (high was supposed to be 60 and I saw snow) and it can’t be the days off work (that would be 0) so it has to be the Thin Mints. Last year I celebrated with an alcoholic overture to the cookie but this year I made a chocolate bark. 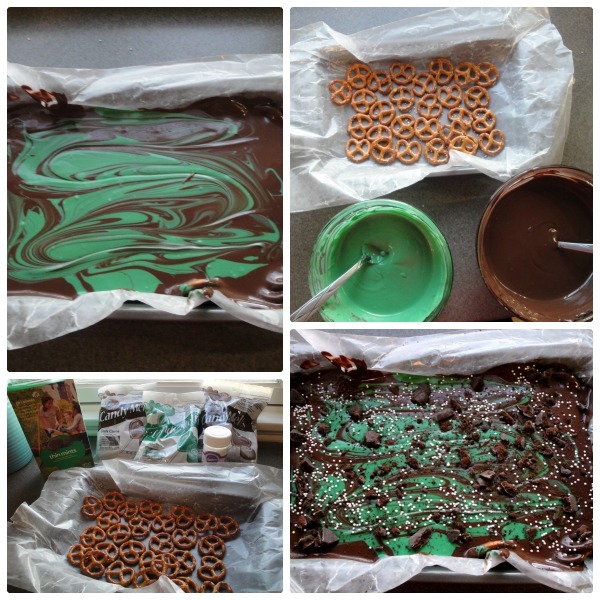 The key ingredients here were 2 bags of dark cocoa melts, 1 bag of green candy melts, 1 cup of mini pretzels, 3 Thin Mints, and some sprinkles. Place a single layer of pretzels in a pan lined with wax paper. Melt your chocolate in 30 second intervals until smooth when stirred. Repeat this process with the candy melts. Pour the chocolate on either end of the pan and pour the candy melts into the center of the pan. Swirl the chocolate and candy melts into a pattern. Toss on crumbled Thin Mints and sprinkles. 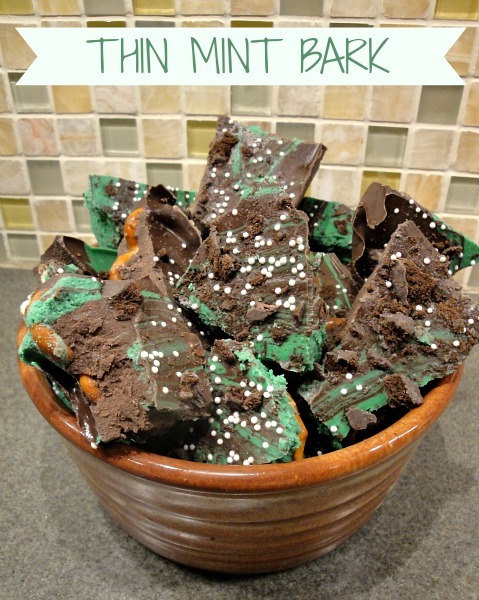 Place the pan in the fridge for about 20 minutes before breaking apart the candy bark and enjoy! It’s time again for another cookie recipe. This one happens to have just 5 ingredients thanks to starting with a cake mix. 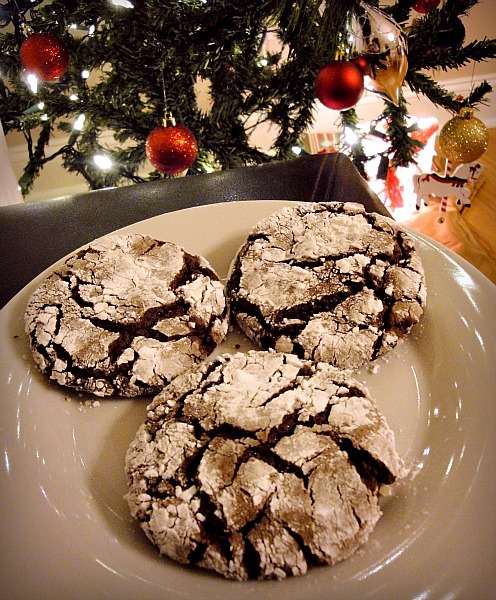 These chocolate fudge crinkles are a new recipe in my house but they went over so well I wanted to share them. I used a Betty Crocker chocolate fudge cake mix but I think this would go over great with the other cake mix flavors like strawberry or even yellow cake mix for a gooey butter-like cookie. The secret to these cookies is to make them quite big before rolling them in powdered sugar. Don’t be tempted to make a ton of cookies since these get the best rise and crinkled effect if you just make 1 cookie sheet of cookies from this recipe. The double rolling in powdered sugar also makes sure the final cookie gets the maximum color contrast for that snow-dusted cookie effect. These cookies are very rich so make sure to eat them with some milk! Stir together the cake mix, oil, water and eggs until it forms a very thick dough. Chill in fridge for 20 minutes to an hour. Remove dough from fridge and quickly scoop into 1-inch balls. After shaping each ball, roll it in powdered sugar and let it rest on a cookie sheet. 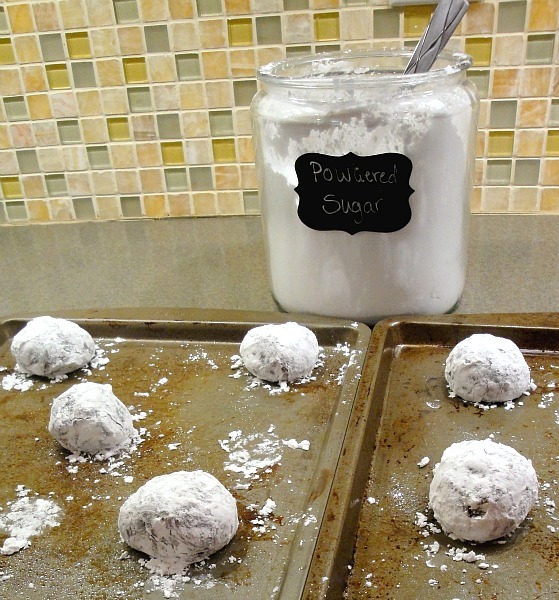 Once all the balls have been shaped, roll each ball in powdered sugar for a second time. Bake for 10 minutes at 350 degrees. The centers of the cookies should be slightly gooey. Cool for 5 minutes on the pan before removing to a wire rack until completely cooled.